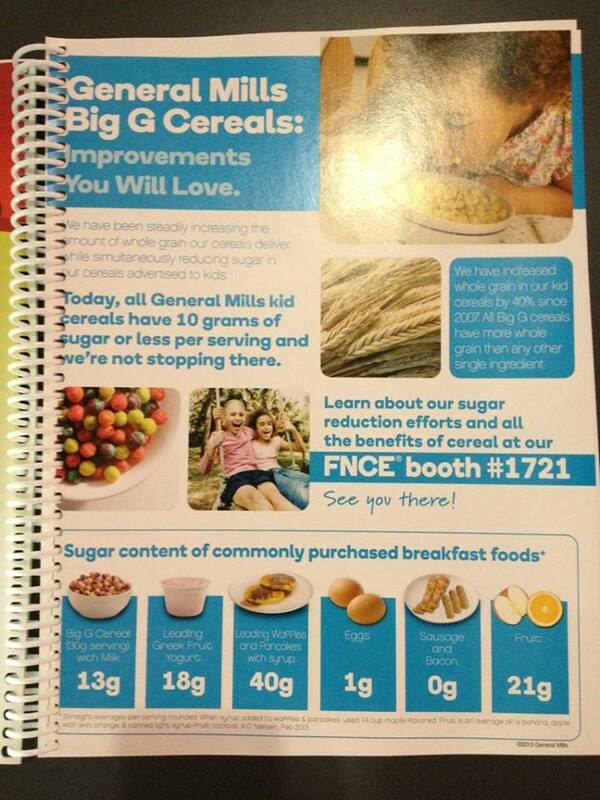 The above photograph shows what is essentially a full-page advertisement by Academy partner General Mills in the FNCE booklet, touting the company’s sugar reduction efforts with its Big G cereals. It should be noted that Big G cereals include highly processed and minimally nutritious offerings like Golden Grahams, Count Chocula, Cookie Crisp, Frosted Toast Crunch, Lucky Charms, and Cocoa Puffs. Keep in mind, too, that while whole grain may be the first ingredient, most of these cereals only offer 1 gram of fiber per serving (many list sugar as the second ingredient and contain artificial dyes). What we found most misleading about this “educational” advertisement was the idea that a bowl of General Mills cereal with milk is a better choice than fruit since it is lower in sugar. That is precisely the sort of misleading and deceptive nutritionism that Big Food often employs to healthwash its offerings.